Tui waiting for some Bling but watch out for those claws! # Fewer birds of key species esp. the big three; Silvereye, Greenfinch and House Sparrow. # Bad weather days, several of our banding sessions were affected by weather which meant that fewer nets were put up and a reduced catch. # My health, with several surgical procedures during the year the timing of sessions was disrupted. Since starting banding at the Zoo in July 2000 we have banded 7038 birds and made 2369 recaptures. Our oldest bird of each species banded at the Zoo in days from banding are; Blackbird 3299 (dead) 2621 (live), Chaffinch 1780 (recaptured at Houghton Bay), Goldfinch 1428, Greenfinch 1792, Dunnock 1355 (dead) 1190 (live), House Sparrow 2457, Fantail 154, Grey Warbler 1519, Silvereye 2674, Starling 2918 (dead) 2261 (live) Song Thrush 889, Tui 2269 (dead) 2350 (live colour band sighting). # 1 Silvereye – 139 (74) the usual No species but a big drop from the 330 in 2010. Silvereyes almost disappeared from most of our banding sites mid winter. This coincided with a big increase in numbers feeding on Karo flowers in the Houghton Valley where we caught record numbers. # 2 Greenfinch – 128 (80) usually either No 2 or 3 but again a big drop from last year, this appears to be a real drop in numbers as it was across all banding sites. Were there fewer birds or did the country birds not come to town? # 3 House Sparrow – 80 (15) usually alternate with Greenfinch for 2 & 3 spot, for the third year in a row Sparrow numbers crashed in the autumn. # 4 Chaffinch – 46 (7) usually in 4th or 5th position. # 5 Fantail – 20 (3) most birds caught at the stream on summer evenings. # 8 Dunnock – 8 (3) a considerable drop in numbers from recent years. # 9 Starling – 7 (4) also a big drop with Starling appearing to have had a poor breeding season in 2010. # 10 Yellowhammer – 3 (0) very few came into the Zoo last winter possible due to the hay being fed having very little seed. # 12 Grey Warbler (2 (1) not many but the recap was a cracker; doubling the age of any recap at any of our sites. # 13 Song Thrush – 1 (0) still a mystery to me why we catch so few as there are reasonable numbers about the net sites. No Kingfishers or Magpies were banded this year but we did catch a new species; a Morepork. One was caught when it tried to take a Chaffinch out of a net one afternoon before Christmas when I was checking the stream site for birds. As our permit doesn’t cover this species it was let go unbanded. 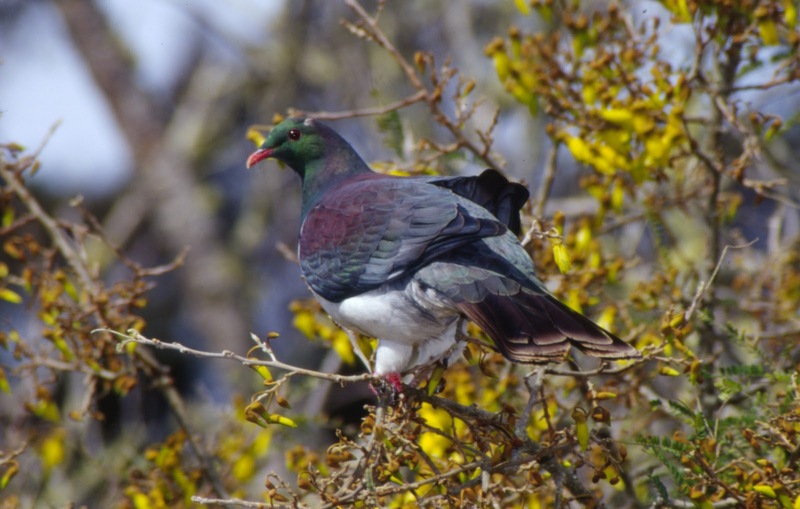 As well as wild free flying birds we banded a number that were in rehab at the "Nest" (Animal Hospital) and the most numerous and perhaps most interesting were 10 Kereru, most of which were at the Nest as a result of a collision with a window. A special thanks to the Zoo staff, especially the Bird team for their continuing help and support. I spent a few hours at the stream over the fence from the Zoo on Tuesday afternoon. After the quiet time at Houghton Bay on Saturday I expected to band a few birds and have a snooze in the shade but I was wrong. After getting the nets up I furled a couple after the first net round so that I could manage the numbers and even then I took a few short cuts with the processing. In all I caught 61 birds of 6 species with 55 new and 6 recaptures. Not a big recapture rate but most of the birds were juveniles. Goldfinch - 11 (0) the highest tally ever caught at this site. Silvereye - 21 (6) the oldest recap banded in Feb 2010 which in Silvereye terms in not very old. Silvereyes in net waiting their turn to be processed. Five of us gathered at the Houghton Bay stream Saturday morning for a bit of banding. The catch was a bit lower than I had expected especially after the last few days of warm dry weather. In all we caught 26 birds of 6 species with 23 new and 3 recaptures. One of our colour banded Tui has made it to Britain! Not a British garden but the British Guardian newspaper. I have just recieved a copy of a photo that was published late last year. It is of a bird on Mt Victoria that was banded in Roseneath in Dec 07. Spent a couple of hours at the little stream next to the Zoo this afternoon caught a total of 37 birds of 5 species with 29 new and 8 recaptures. Annette, Anneke, Bernard and I had a successful banding session at Island Bay on Sunday morning, despite a fairly strong wind. In all we caught 100 birds of 8 species with 94 new but only 4 recaptures, the recapture rate was surprising and a bit disappointing but goes to show the large number of birds at this site. Blackbird – 26 (3) almost all were Juv’s and only 2 of the 30 caught last month were recaptured and there were still a considerable number unbanded when we left. Chaffinch – 12 (0) the most caught at this site ever in one day but had hoped for a recap or two. House Sparrow – 45 (1) Most were young birds but there were about 10 adults. The only recap was banded at a site in Whither St on the other side of the valley which means none of the 1100 Sparrows we have banded at this site in the last 5 years were recaptured. The more I have to do with this species the more I realise they are clever little dickie birds, especially about learning to avoid mist nets. All in all a pretty good morning which included the usual great hospitality.